THE STORY - He was the pride of Bayonne, N.J., a man who went 15 rounds in the ring with Muhammad Ali. But before all of that, Chuck Wepner was a liquor salesman and father with a modest prizefighting career whose life changed overnight when, in 1975, he was chosen to take on Ali in a highly publicized title match. It's the beginning of a wild ride through the exhilarating highs and humbling lows of sudden fame, but what happens when your 15 minutes in the spotlight are up? THE BAD - All other cast members don't get as much to do as Schreiber and the story is nowhere near as interesting as you would hope. “Chuck” is a movie about the guy whose life story inspired the movie “Rocky” and the actor who plays Sylvester Stallone in “Chuck” bears an uncanny resemblance to the real Stallone. This symmetry provides Philippe Falardeau’s film with a referential wink. “Chuck” is a pleasing and deftly acted addition to the canon of boxing films, but it is neither fresh nor necessary for today's audience. The movie both benefits and suffers from its conventional structure. Chuck Wepner makes for fascinating company, even if his story feels as antiquated as the Seventies-era fashion that populates each scene. 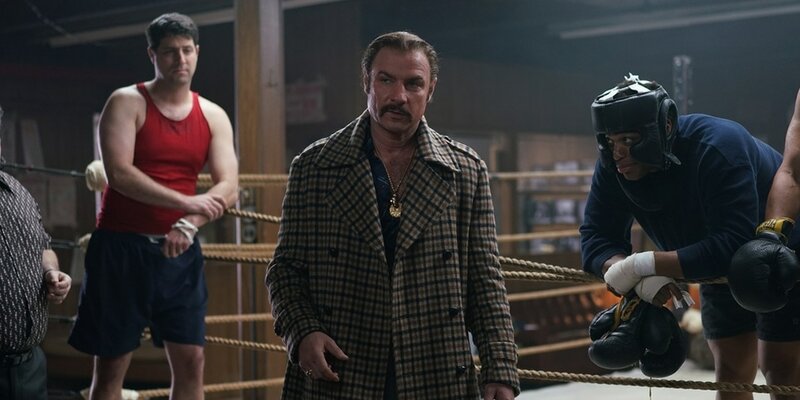 Liev Schreiber energizes the proceedings with his portrayal of Wepner, a former heavyweight boxer forever adored in his hometown of Bayonne New Jersey for trading punches with Muhammad Ali for 15 bruising rounds in 1975. Wepner’s ascendance to local hero status caught the attention of a young Sylvester Stallone, who affectionately based his “Rocky” screenplay on Wepner’s career. Like many a boxing movie, “Chuck” is concerned not with its subject’s experiences inside the ring but with his psychological demons outside of it. The success of “Rocky” inflated Wepner’s ego and exacerbated his philandering, drug-fueled ways, which drove him away from his family and plunged him into the depths of infamy. As his boxing prospects vanished, he sought redemption through a more personal forum by attempting to reconcile with his family and friends. Does this story sound familiar to you yet? Liev Schreiber propels “Chuck” beyond the screenplay's clichéd mediocrity. His performance is graceful and physical, and the screenplay, which he co-wrote, humanizes and pays homage to Wepner without sanitizing the destructive aspects of his personality. But while the film offers a full assessment of its subject, it overlooks the people who were most instrumental in his life. Elisabeth Moss is terrific as Wepner’s wife, but the movie gives Moss little material aside from the reactions of the aggrieved spouse. Naomi Watts’ character, a bartender initially unimpressed by Chuck’s swagger who gradually warms to his advances, receives similar treatment. Watts (An interesting casting choice given the fact that she and Schreiber spent 11 years together as a real-life couple but recently separated) is an actor of the highest order, but she is mired here in a role that exists solely for the purpose of being a love interest for the male protagonist. The entire supporting cast consists of stereotypes, from Chuck’s loyal friend (played by a splendid Jim Gaffigan) to his responsible brother (Michael Rappaport) to his aging trainer (Ron Pearlman). “Chuck” is fully aware that it occupies well-traveled territory, and it makes more than a few amusing nods to its position as yet another boxing movie. The film’s warm and harmless nature makes its flaws easy to forgive. As a result, “Chuck” situates itself in a middle ground between the greatness of “Raging Bull” and the joylessness of “Southpaw.” I suppose it is unfair to assess “Chuck” in relation to other boxing movies, but a movie such as this would surely appreciate the classification.